The Epiphone Hummingbird PRO Acoustic/Electric guitar brings the legendary country/rock “Hummingbird” into the 21st century with the new Shadow™ ePerformer HD™ preamp and Shadow NanoFlex HD™ pickup system. First introduced in 1960, the square shouldered Hummingbird quickly became a classic thanks to Keith Richards of The Rolling Stones, who used a Hummingbird for rhythm on early Rollings Stones hits like “Satisfaction,” “Play With Fire,” and “Under My Thumb.” There are also many iconic photographs of Keith using a Hummingbird on sessions for Exile on Main Street, Goat’s Head Soup, and Sticky Fingers. Today, the Hummingbird is still a go-to acoustic for rockers like Noel Gallagher, Sheryl Crow, and Kid Rock when they need a rhythm guitar with smooth action and superb “woody” tone that’s full of character. On its own, the Hummingbird PRO Acoustic/Electric can stand out in a crowd with an all-acoustic band or picking party with its sweet, balanced tone. And now with the Shadow™ ePerformer™ preamp and Shadow NanoFlex™ pickup system, the Hummingbird PRO can plug-in and hold its own on any size stage. Thought there are many guitars that claim to be “historic” or “vintage” styled, only one comes with a Limited Lifetime Guarantee and Gibson 24/7/365 customer service and the experience of a century of guitar making. Go with the best. Visit your Authorized Epiphone Dealer and get an Epiphone Hummingbird PRO Acoustic/Electric today. The Hummingbird PRO Acoustic/Electric features a solid spruce top. Spruce is a rich and complex tonewood that begins to breathe and improve with age. The more you play, the better it sounds! The body and neck are made from select mahogany. The neck features a 24.75” scale and is attached to the body with a glued-in dovetail joint. The neck profile is Epiphone’s classic SlimTaper™ D profile. The fingerboard has classic pearloid parallelogram inlays, 20 medium frets, a 12” radius, and a 1.68” neck. 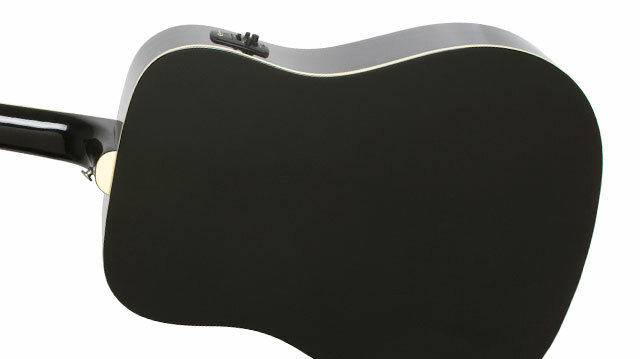 There is single ply white binding around the neck, and the sloped dovewing headstock has the “Epiphone” logo in white. The body top has 5-ply white and black binding while the body back has single ply white binding like vintage originals. The Hummingbird PRO Acoustic/Electric’s reverse belly bridge has a compensated saddle for smooth action and intonation. The Shadow NanoFlex™ pickup system is under the saddle and the classic Hummingbird/flower tortoise shell style pickguard is easy to spot from stage or across the room. For over a decade, Epiphone and Shadow Germany have worked together perfecting ways to amplify an acoustic guitar on stage without sacrificing tone. The Hummingbird PRO is just one of many Epiphone guitars that feature their cutting edge HD pickup system that can handle any size gig and still produce an “acoustic” sound. 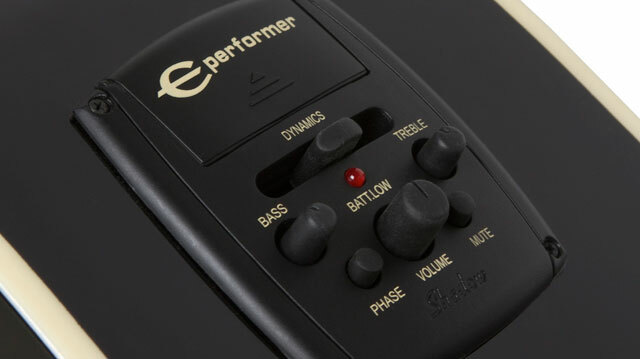 The Hummingbird PRO’s controls for the Shadow™ ePerformer™ Preamp are on the upper bout and include controls for Master Volume, Treble and Bass EQ, Mute, and a Dynamics control adjusted via a frequency curve. There is also a low battery indicator. The preamp is powered by two AAA batteries. The output jack and strap locks are nickel and the Hummingbird PRO Acoustic/Electric is strung at the Epiphone factory with time tested D’Addario Phosphor (12-53) strings. The Hummingbird PRO comes in a beautiful Ebony color finish.